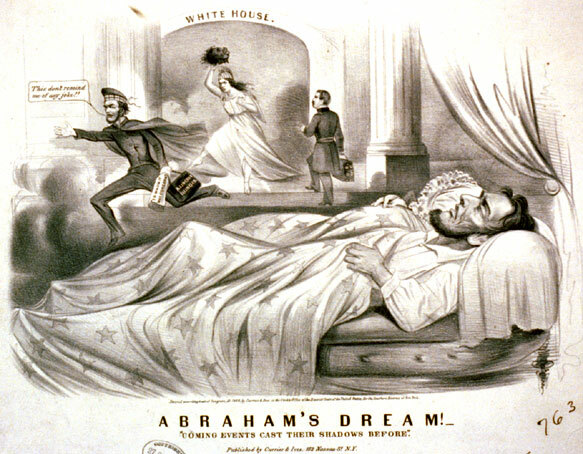 Description: The artist portrays a President tormented by nightmares of defeat in the election of 1864. The print probably appeared late in the campaign. (The Library’s copy was deposited for copyright on September 22.) Lincoln was said to have believed in the prophetic importance of dreams. The President lies on a bed under a sheet embroidered with stars. In his dream Columbia or Liberty, wielding the severed head of a black man, stands at the door of the White House. She sends a frightened Lincoln away with a kick. Lincoln, wearing a Scotsman’s plaid cap and a cape and carrying a valise, flees to the left, saying, “This don’t remind me of any joke! !” The cap and cloak allude to an incident in 1861 before Lincoln’s first inauguration. On being informed that an attempt would be made to assassinate him on his way to Washington, Lincoln took a night train and disguised himself in a large overcoat and Kossuth hat. The press made the most of Lincoln’s timidity, and it was widely reported that Lincoln was seen wearing a Scotch plaid cap and a very long military cloak. Lincoln also carries a rolled piece of paper “To whom it may concern.” For this famous announcement, see “The Sportsman Upset by the Recoil of His Own Gun,” no. 1864-32. At right General McClellan, in uniform, ascends the steps to the White House, carrying a valise with his initials on it.